The delectable combination of fish and fragrant spices make it a most impressive starter – or even the star of the show. 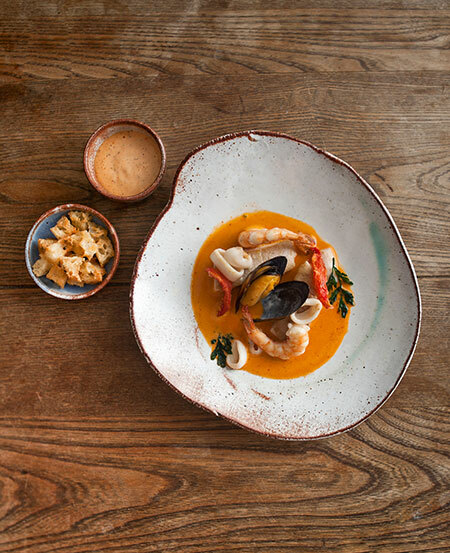 The Plettenberg Hotel signature dish comprises only the freshest ocean bounty. The delectable combination of fish and fragrant spices make it a most impressive starter – or even the star of the show. Taste it in the beautiful surroundings of SeaFood at The Plettenberg, then try the recipe at home to wow your dinner guests. 1. Put all the ingredients into a large pan and simmer very gently for 30 minutes. 2. Strain through a muslin-lined fine sieve, and use as required. If not using immediately, leave to cool, then chill and refrigerate or freeze. 1. Heat the olive oil in a large pot, add the vegetables and garlic and cook gently for 20 minutes until soft but not coloured. 2. Add the orange zest, tomatoes, red pepper, bay leaf, thyme, saffron, cayene pepper, and the fish pieces. 3. Cook briskly for 2 – 3 minutes, then add the strained stock and orange juice, bring to the boil and simmer for 40 minutes. 4. Liquidise the soup, then pass through a sieve into a clean pot, pressing as much liquid as possible with the back of a ladle. 5. Return the soup to the heat and season to taste with salt, pepper and a squeeze of lemon juice. 1. Thinly slice the baguette on the diagonal and fry the slices in the olive oil until crisp and golden. 2. Drain on kitchen paper and rub one side of each piece with the garlic clove. 1. Cover the slice of bread with the water and leave to soften. 2. Squeeze out the excess liquid and put the bread into a food processor with the harissa, garlic, egg yolk and salt. Blend until smooth. 3. With the machine still running, gradually add the oil until you have a smooth, thick, mayonnaise-like mixture. Keeps in the fridge for at least a week. The Plettenberg is situated on a rocky headland in one of South Africa's most spectacular beach towns. Tucked neatly into the Garden Route, Plettenberg Bay boasts a year-round temperate climate, pristine beaches and dense green forests, making it the ultimate South African seaside escape. The Plettenberg is a five-star property that has direct beach access and showcases some of the most breathtaking vistas in Southern Africa, with views of the ocean, mountains and endless stretches of golden sand. The hotel features 37 beautifully appointed guest rooms, including 12 Suites and two spectacular Villas.